The Phoenix Coyotes have now made the playoffs for three straight years, and in what has become a continual irony, the squad from the non-traditional market of Glendale, Arizona has had to face Original Six foes in the playoffs’ opening round. The past two years, their foe has been the Detroit Red Wings, but this season, they decided to change things up a bit and draw a first round date with the Chicago Blackhawks. Now, with their playoff matchup set to begin tomorrow, the fanbases of both clubs are getting prepared to face one another, and despite the two clubs playing each other four times, there is still a lot to learn about each other as the opening face-off in the desert draws near. In fact, there are six important questions that need to be examined as things get set to begin, and the answers to these questions will be the key to which team ends up advancing toward the Stanley Cup. Can the Blackhawks’ Defense Get Their Act Together? When the Hawks won their Stanley Cup in 2010, they had a lot of high-flying offensive weapons, but perhaps their biggest key was their defense. They kept a lot of shots from reaching the net with the shot-blocking exploits of Brent Sopel and Niklas Hjalmarsson, among others, and they were blessed to have a top-tier shutdown pairing with Duncan Keith and Brent Seabrook playing at the top of their powers. This year’s Hawks team has been, needless to say, not as good as those key areas. They struggled for quite a while this season in allowing too many shots, and they are the second worst playoff team in terms of goals against, allowing 2.83 tallies per game against them. Factor in their weak penalty killing and the lack of positive contributions from guys like Hjalmarsson and just about anyone they’ve thrown on the third pairing, and you have a recipe for a serious issue on the blue line. A couple of things do have the potential to improve their performance in this area, however. The Coyotes are only in the middle of the pack in shots on goal per game (29.6), and the Hawks have been improving their performance in terms of limiting shots this year, moving from near the bottom of the league all the way up to 9th best in the NHL over the course of the season. Factor that in, along with the playoff experience of guys like Keith, Seabrook, and Sean O’Donnell, and the Hawks might very well be able to surprise some people with a more concerted defensive effort. Can Radim Vrbata Make His Former Team Regret Letting Him Go? 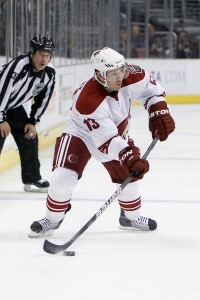 The Coyotes have a well-earned reputation as a defensively-minded team, as would any team that has Dave Tippett as its head coach. Their focus is to play a gritty and physical style of play, and with a roster that isn’t exactly loaded with offensive dynamos, it was a necessary adjustment to make in a division that is loaded with teams with serious firepower. Over the course of this year, however, the Coyotes have started to become a bit more adept at pouncing on chances and scoring goals, and a lot of that credit has to go to two individuals: Ray Whitney and Radim Vrbata. Whitney may be the elder statesman on this team, but he is still quite capable of producing more than his fair share. Not only did he get his 1000th point this season (the 78th player to do so in NHL history), but he also played all 82 games and dished out 53 assists, also a team high. He also racked up 20 points on the power play, leading the team in that category as well. Perhaps the biggest beneficiary of that success was Mr. Vrbata. Despite missing five games, Radim ended up scoring 35 goals, including a team-leading nine power play tallies. His quick hands and great ice vision have been lauded by writers for the Arizona Republic and others, and he seemed to really turn up the heat when the Coyotes were driving for a Pacific Division crown. That ability to come through in the clutch could potentially translate into this series, as it will be the first time he faces his former team in the cauldron of the NHL playoffs. If he can get hot and put the screws to them, this series could be over quicker than anyone is anticipating. Will Jonathan Toews Be Able to Make a Difference? Despite their captain missing the last 22 games of the regular season, the Blackhawks were still within one regulation victory of grabbing the fourth seed and home ice in the NHL playoffs. His absence due to a concussion obviously had a negative impact on just about every facet of their game, as he is arguably the team’s best all-around player and gets significant ice time in all departments. He had been dealing with symptoms from the concussion during his on-ice work over the past few weeks, but finally on Wednesday he was able to make it through an entire practice without encountering any of the issues he’s been dealing with, and it looks like Joel Quenneville will be able to pencil him into the lineup between Patrick Kane and Marian Hossa when the puck drops on Thursday night in Glendale. 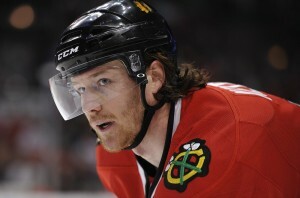 But just how effective will Toews be? After all, 22 games is no small number, and there always is a bit of catch-up that has to be played when it comes to getting back up to game speed. It’s especially crucial when you consider that Toews is a key catalyst for the power play as well as the top offensive line, and his game is predicated on speed and being able to tangle physically with forwards trying to clear him from the front of the net. One potentially positive sign for Hawks fans wondering whether Toews will be able to make a positive impact right away is the way that Sidney Crosby was able to return from his concussion. He missed over three months of this season with his head injury, and all he did in his first four games was rack up nine assists. He did look sluggish at times, but his instincts really took over quickly, and one could expect that a cerebral player like Toews could be able to do the same thing. Can the Coyotes Power Play Break Through Against the Hawks? Much to the chagrin of fans of the team, the Phoenix Coyotes have not been able to convert on opportunities to make teams pay for their mistakes. In fact, there was only one team in the NHL that was worse than them on the power play, and when the playoffs begin, you have to be able to take advantage of those times when you have an extra man on the ice, because scoring chances dry up when teams are playing not to lose. The Coyotes may very well get an opportunity to improve on that number, as the Blackhawks aren’t exactly adept at preventing teams from scoring on the power play. They finished the season ranked 27th on the penalty kill, allowing goals on nearly 25% of the man-advantage situations that they faced. Whether this was based on poor strategy or poor execution is irrelevant, because they have the potential to make any team look good when they are a man up on Chicago. One thing that could potentially work to Chicago’s advantage is the return of Dave Bolland and Toews to the lineup. Both players averaged nearly two minutes per game on the penalty killing unit, and so their return to the team could spark a revival of the team’s fortunes in that area, and that could spell doom for Phoenix. 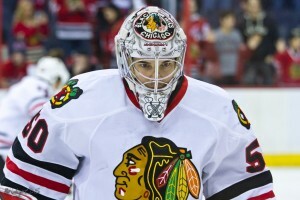 Which Corey Crawford Will We See? In his first full season on the Blackhawks roster, Crawford was arguably the biggest contributor to their success a year ago. The Hawks barely made it into the playoffs last year, and when they got there, it was Crawford’s stellar presence in net that even allowed them to make it to a seventh game against the Vancouver Canucks despite being down three games to none in the series. This season however, Crawford hasn’t exactly been his stellar self. He has relinquished the starting job to Ray Emery on several occasions, and really hasn’t looked like the confident goalkeeper that he was last year. He has been doing a lot better as of late, but memories of those early season struggles still haunt Blackhawks fans, and lead some to question whether he will be able to withstand the rigors of playoff hockey. A reason for optimism for the Hawks is that he ended up having a pretty strong March. He gave up 17 goals in his nine appearances, and he recorded a save percentage of .914. He also recorded a 7-1-1 record, so the team has to hope that he rides the wave of that momentum as they get set to play the Coyotes. Will a Lack of Distractions Mean a Stronger Effort from Phoenix? During the 2011 playoff series against the Red Wings, stories kept breaking about the inevitable move of the Coyotes back to Winnipeg, the city that they had left 15 years previous after a playoff defeat at the hands of….the Red Wings. These stories likely did nothing to help the focus of the team as they tried to get out of the first round, but they were unsuccessful as they got swept out by the Wings with ease. This season, however, things could be different. According to reports in the Phoenix Business Journal and others, the city of Glendale and the NHL are in intense negotiations with Greg Jamison, the former CEO of the San Jose Sharks, and both sides are optimistic that they will be able to reach a deal at some point in the next month. This confidence may be a recurring theme throughout the saga that the Coyotes have gone through ever since they were sold at a bankruptcy auction to the NHL in 2009, but it is a far cry from the sense of doom that pervaded the mood of the team in last year’s playoffs. There is a very real chance that the Coyotes could benefit hugely from the potential resolution to their ownership issues, and if that ends up being the case, then the boost of confidence that they could get from knowing which city they will call home next season could very well be the difference between a first round playoff exit and a prolonged run towards an improbable Stanley Cup.